I've just finished implementing an interactive marine forecast map at http://www.geoffschultz.org/marine_forecast_map.php. 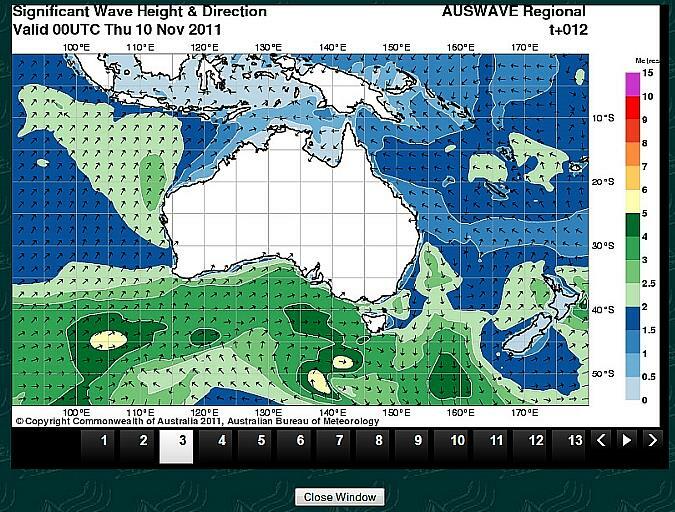 You can click anywhere on the map (over water) and a new window will appear showing you the forecast for that position. I've also added links to all of my logs which take you to a forecast for that location. The data for this forecast was provided for free by World Weather Online. Note that I've seen large discrepancies between their forecast and other sources, so take it as a simple datapoint and use your own judgement to determine its accuracy. It even works on inland waters! 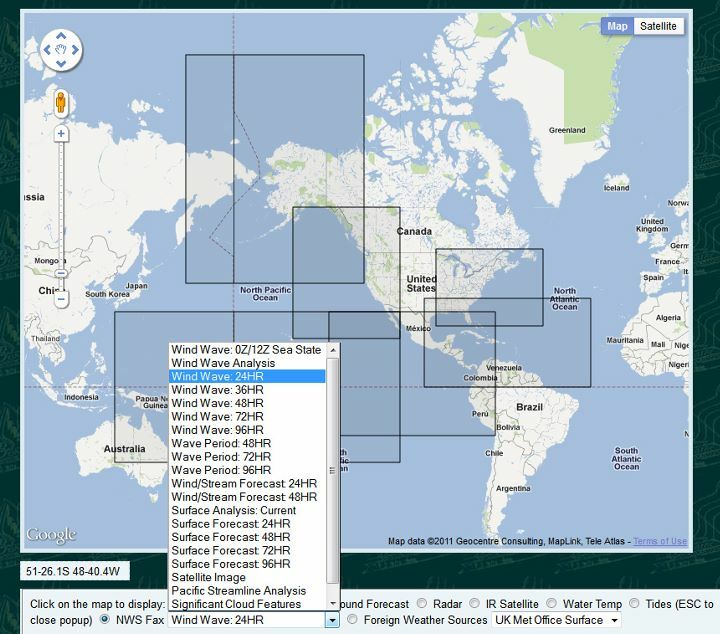 I've just completed updating my weather page (http://www.geoffschultz.org/weather_map.php) so that you can view either a marine forecast, Wunderground forecast, radar image, or visual/IR satellite images of an area just by clicking on a google map. 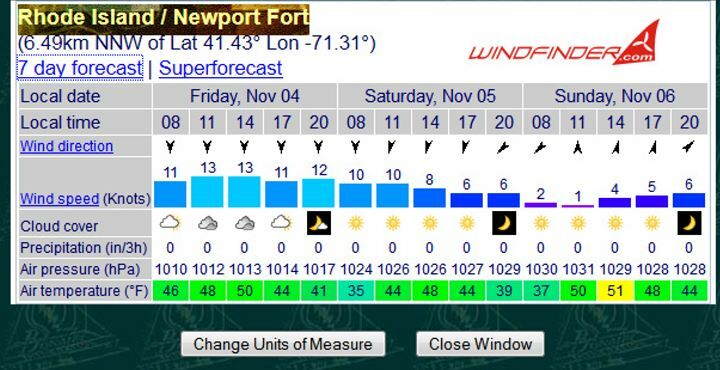 You can also select each of the units of measure that you want the forecast to be displayed in. During periods where I haven't been out doing stuff with the generator, playing with the chain saw, or hosting people without power, I've been continuing to work on my weather mashup. I've made significant progress in that I've added most of the NOAA/NWS weather fax products. The map now shows outlines of the charts that are available. As someone who uses the NWS Weather Fax web site all of the time, I must say that it's really quite enlightening to be able to just click on a map to display all of this information. Much more intuitive. I'll add the upper wind charts when I have a chance to geo-code them. You'll also note that I've add the UK Met Office graphics to the map. I've now added Windfinder.com as a weather source for my weather mashup. It's one of my favorite sources and they just told me how to do it. 1) I have included current projections from NOAA's Ocean Prediction Center. These are in the NOAA Charts pull-down menu section. 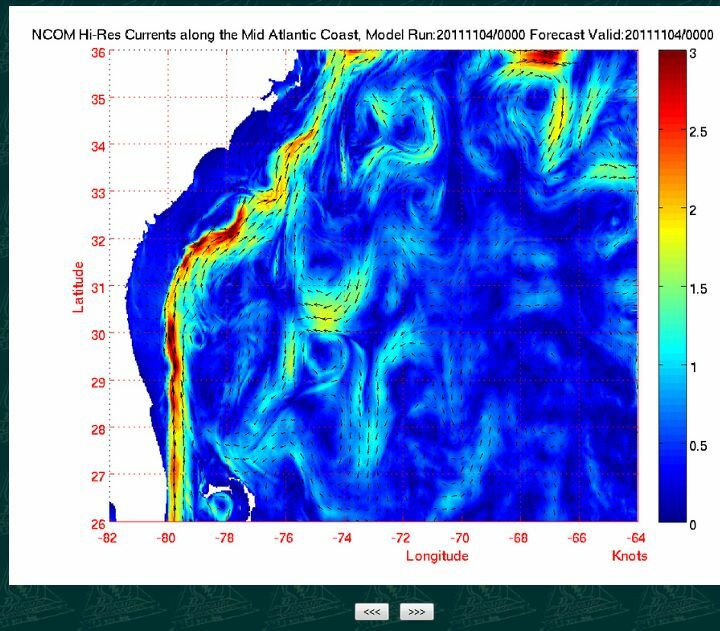 The example here shows the Gulf Stream off of Florida. Next, I've added user definable markers. Simply RIGHT-CLICK on the map and a box will appear asking you to name the location. You can create as many markers as you want. To delete them, right click on the marker. These are stored as cookies in your browser, so they won't appear on another computer or a different browser on the same computer. If you delete your cookies, they'll disappear. 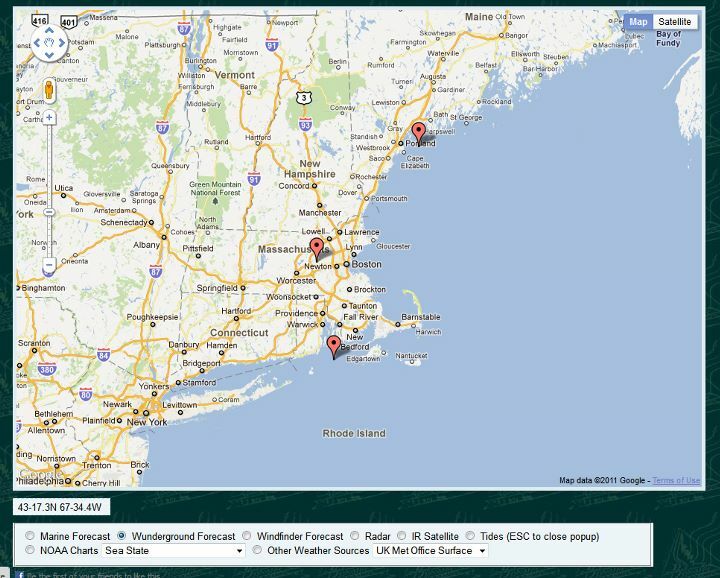 (1) I've now added the National Weather Service text forecasts to the map. 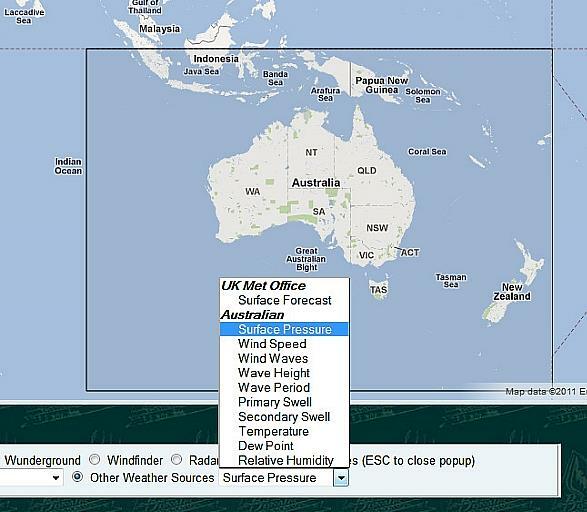 This means that you can click anywhere in the US and get either the land, on-shore, or off-shore forecast for that area. Today's additions to the interactive weather map. (1) I added a bunch of data from the Australian Weather Bureau. These are animated 72 hour charts. Very nice. However I'm worried that the directory structure of the files seems to change, so I'm not sure that I can determine the correct file names. Hopefully I can as they've got a lot of great content for that portion of the world. (2) I have replaced my simple next/previous button image viewer for animated sequences with a much nicer one that I paid a whole $10 for. I decided that I had better things to do with my time than re-invent the wheel and it was well worth it for the price.